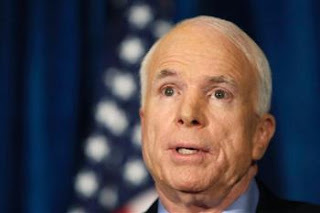 AmericaPANIC: Picking Up the Pieces After the Republicans Wrecked America: John McCain. A shadow of his former self. Unrecognizable. Desperate. Angry. Mean. Cynical. And a candidacy in full and devastating decline. John McCain. A shadow of his former self. Unrecognizable. Desperate. Angry. Mean. Cynical. And a candidacy in full and devastating decline. I felt it was my patriotic duty to help tear this campaign down. I think my work here is nearly done. This race, and the McCain candidacy, is over. And after it's over, John McCain should apologize to the American people for running the most disgusting and reckless campaign in American political history. DO NOT LET UP. THAT IS WHAT THE GOP IS COUNTING ON. Remind everyone you see today that John Herbert Hoover McCain is an elderly senile out-of-touch bitter warmonger and champion of chimpy Bushco and his runing mate Mooseturd Palin is the biggest political joke in a century are disasterous on their own regards but put together and running ths USA? Palin makes Bush look smart and McCain makes Moses look young. McCain will win, Diebold will make sure of it. Watch it happen.